Today’s post is brought to you by our guest blogger Alice Newman. Alice is a volunteer at HMNS and a contributor to our magazine, the Dashing Diplodocus. Photo by jjsala, on Flickr. Taken during an HMNS Flickr meetup. Interested in attending a future event? Follow the discussions on the HMNS Flickr Pool. Ghosts, witches, and devils are haunting our halls! No, they aren’t left over from Halloween, rather, they are the spooky tales that accompany the exhibit Real Pirates. In The Narrow Land, a collection of Cape Cod folk tales, author Elizabeth Reynard relates how young Sam Bellamy met golden-haired Maria Hallett beneath a blossoming apple tree in the Wellfleet cemetery. The two became lovers, and when Sam sailed to scavenge treasure from Spanish shipwrecks off the coast of Florida, he promised to return and marry her. Unsuccessful in his quest, Sam turned to piracy, eventually commandeering the Whydah, which wrecked in a terrible storm within sight of Maria’s hut. According to legend, Maria looked desperately for Sam’s body among more than one hundred that had washed ashore. Locals say she still searches for Sam; her mournful wails can be heard echoing off the Eastham cliffs. Some believe she had been “ruined” by Sam, and, in revenge, caused the Whydah to be destroyed by selling her soul to the devil in exchange for Sam’s. Others say she was a witch, who danced and sang madly along the shore and lured the Whydah to its harrowing doom. And what of Sam Bellamy? In the fall of 1717, the same year that the Whydah went down, a mysterious, dark-haired stranger arrived in Wellfleet. He appeared to be anxiously waiting for someone and became a regular visitor to the cemetery and tavern that Maria and Sam had frequented. Though he had no job, he was well dressed and always had ready money. He died in his sleep three years later, beneath the same apple tree where Maria and Sam had first met; a belt of gold was found around his waist. 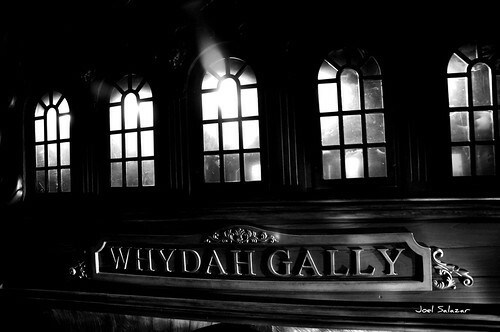 Spirits associated with the Whydah continue to linger nearly three centuries later. Barry Clifford, discoverer of the Whydah’s remains, recounts in his book, Expedition Whydah, how the start of his 1998 exploration was plagued with constant, often inexplicable obstacles — engine problems, an undermanned crew, GPS malfunction, heavy fog, a shark encounter, and more. While their salvage vessel was positioned over the wreck site, a crew member using a hand held radio clearly heard a voice over the open receiver repeating, “We want your boat… We want your boat…” Were the pirates of the Whydah trying to protect their treasure? The treasure hunters poured most of a bottle of rum into the water over the wreck site area and shared the rest in a symbolic drink with the pirates. Their troubles ceased, and that season turned out to be one of their most successful, with the explorers ultimately finding the ship’s wooden hull. Photo by jjsala, on Flickr. Taken during an HMNS Flickr meetup. Interested in attending a future event? Follow the discussions on the HMNS Flickr Pool. Maria Hallett has not been at rest, either. During the 1998 expedition season, a shaken patron at a restaurant in Wellfleet stated that he had seen a ghost of a young, blonde woman in the restroom. He quickly left the restaurant after signing his name, Bellamy, on the credit card slip. 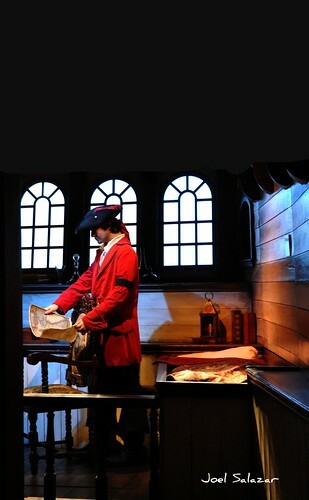 Have the ghosts of the Whydah escorted the artifacts of their ship to our museum? If you find yourself visiting on a late tour, you might just want to keep a pint of rum handy to steady your nerves, or to appease the ghosts of the Whydah! Clifford, Barry and Paul Perry. Expedition Whydah. New YorkL HarperCollins 1999. Reynard, Elizabeth. The Narrow Land, 4th ed. Chatham, MA: The Chatham Historical Society, 1978. Previous Post Giant African Millipedes are back! Next Post Your Favorites: Top 10 Videos of 2010!